Campbell, N.A. and J. Reece. 2008. Biology. Pearson Benjamin Cummings, Glenview, Illinois. Holtan, P. 1990. Bluegill. Wisconsin Department of Natural Resources Bureau of Fisheries Management, Madison, Wisconsin. 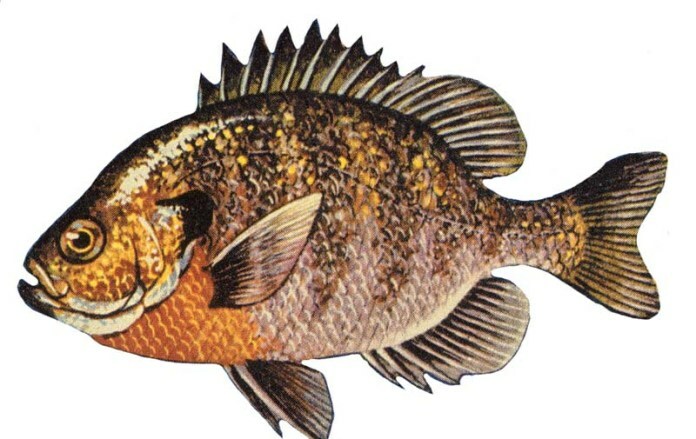 _and_docs/EWG/040528a/04-28-04_fish_bluegill.pdf>. Accessed 29 March 2010. _macrochirus.html.>. Accessed 29 March 2010. Pracheil, B. and P. Muzzall. 2009. Chronology and development of juvenile bluegill parasite communities. Journal of Parasitology. 95:838-845. Rook, E. 1999. 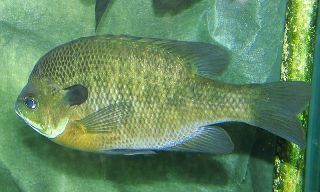 Lepomis macrochirus: bluegill sunfish. <URL:http://www.rook.org/earl/bwca/nature/fish/lepomismac.html>. Accessed 29 March 2010. Smith, P. 2009. Winning the pole position. The Milwaukee Journal Sentinel, Milwaukee, Wisconsin. Spotte, S. 2007. Bluegills: biology and behavior. American Fisheries Society, Bethesda, Maryland. Wirth, D. 2008. Fall’s big bull bluegills. Outdoor Life. 215:28-29.